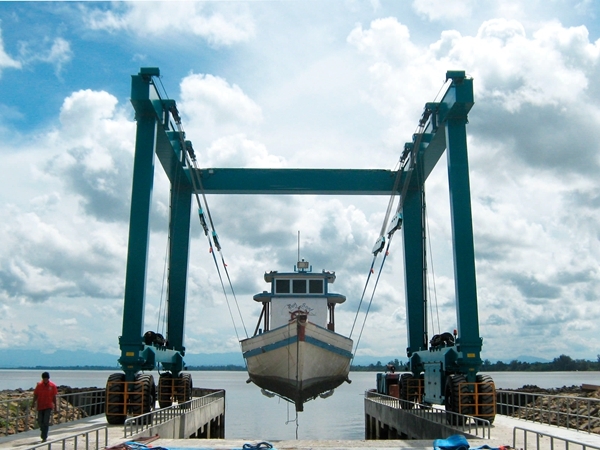 Dock Travel Lift Manufacturer Produces Light Duty Boat Hoist Heavy Duty Boat Hoist With Low Price Top Quality! Dock travel lift is great machine for lifting boat from water, putting boat into water, transporting boat and maintaining boat on the land. According to lifting duty, it can be divided into two types, light duty travel lift, such as 10 ton boat hoist, 25 ton marine travel lift for sale, 35 ton marine mobile boat hoist, 60 ton boat hoist; heavy duty travel lift, such as 200 ton marine travel lift for sale, 500 ton mobile boat lift gantry crane, travel lift 800 ton, 1000 ton marine mobile gantry crane. Customers can choose suitable lifting tons according to practical needs and requirements. Ellsen Group, a well-known and reliable travel lift manufacturer in China, provides top marine boat hoist with factory price, such as construction travel lift, travel lift for water sport meetings, aquatic clubs and voyages, factory direct sales marine travel lift, ISO approval marine boat hoist, remote control travel hoist and cabin control travel hoist. All these gantry cranes are designed and produced according to national standards and checked carefully before delivery. Whatever types of travel lift customers want to buy, they can purchase suitable one from Ellsen! Reliable quality, reasonable price and great performance! How to increase efficiency of dock travel lift? Efficiency is an important factor for buying marine travel lift. High efficiency can help save much energy and time. How to ensure high efficiency? First, choose a professional manufacturer. This can ensure durable material and reliable quality. Top quality is the base for high efficiency. Second, travel lift is equipped with complete safety protection devices. This can make sure high safety and low failure rate. Few accidents means normal work condition! Third, operate gantry crane according to standards. Right and proper operation ensures safety and reduces accident rate. This is effective way to make sure efficiency.